For a price of $102, Andrea will sell you a share which just paid a dividend of $10 yesterday, and is expected to pay dividends every year forever, growing at a rate of 5% pa. So the next dividend will be ##10(1+0.05)^1=$10.50## in one year from now, and the year after it will be ##10(1+0.05)^2=11.025## and so on. The required return of the stock is 15% pa.
A stock pays semi-annual dividends. It just paid a dividend of $10. The growth rate in the dividend is 1% every 6 months, given as an effective 6 month rate. You estimate that the stock's required return is 21% pa, as an effective annual rate. Using the dividend discount model, what will be the share price? A stock is expected to pay a dividend of $15 in one year (t=1), then $25 for 9 years after that (payments at t=2 ,3,...10), and on the 11th year (t=11) the dividend will be 2% less than at t=10, and will continue to shrink at the same rate every year after that forever. The required return of the stock is 10%. All rates are effective annual rates. What is the price of the stock now? You own an apartment which you rent out as an investment property. What is the price of the apartment using discounted cash flow (DCF, same as NPV) valuation? You just signed a contract to rent the apartment out to a tenant for the next 12 months at $2,000 per month, payable in advance (at the start of the month, t=0). The tenant is just about to pay you the first $2,000 payment. The contract states that monthly rental payments are fixed for 12 months. After the contract ends, you plan to sign another contract but with rental payment increases of 3%. You intend to do this every year. So rental payments will increase at the start of the 13th month (t=12) to be $2,060 (=2,000(1+0.03)), and then they will be constant for the next 12 months. Rental payments will increase again at the start of the 25th month (t=24) to be $2,121.80 (=2,000(1+0.03)2), and then they will be constant for the next 12 months until the next year, and so on. The required return of the apartment is 8.732% pa, given as an effective annual rate. Ignore all taxes, maintenance, real estate agent, council and strata fees, periods of vacancy and other costs. Assume that the apartment will last forever and so will the rental payments. Total cash flows can be broken into income and capital cash flows. What is the name given to the income cash flow from owning shares? A semi-annual coupon bond has a yield of 3% pa. Which of the following statements about the yield is NOT correct? All rates are given to four decimal places. (a) The APR compounding semi-annually is 3.0000% per annum. (b) The effective 6 month rate is 1.5000% per six months. (c) The effective annual rate is 3.0225% per annum. (d) The effective monthly rate is 0.2500% per month. (e) The APR compounding monthly is 2.9814% per annum. Mr Blue, Miss Red and Mrs Green are people with different utility functions. Note that a fair gamble is a bet that has an expected value of zero, such as paying $0.50 to win $1 in a coin flip with heads or nothing if it lands tails. Fairly priced insurance is when the expected present value of the insurance premiums is equal to the expected loss from the disaster that the insurance protects against, such as the cost of rebuilding a home after a catastrophic fire. 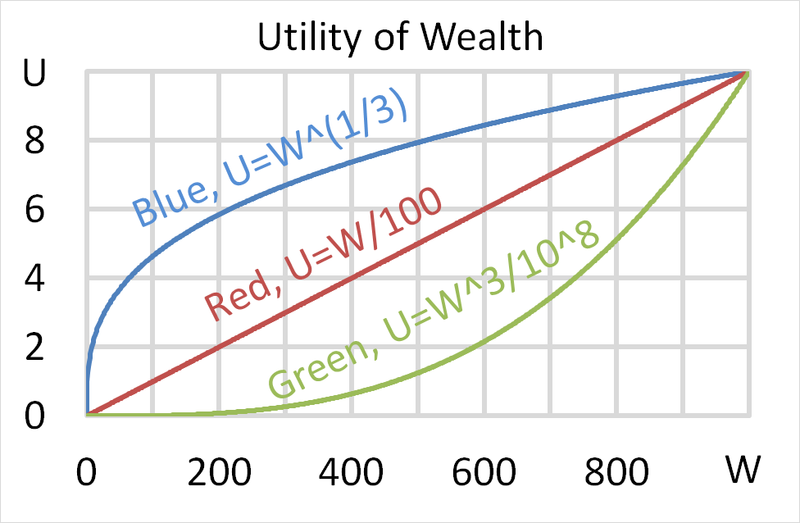 (a) Mr Blue, Miss Red and Mrs Green all prefer more wealth to less. This is rational from an economist's point of view. (b) Mr Blue is risk averse. He will not enjoy a fair gamble and would like to buy fairly priced insurance. (c) Miss Red is risk-neutral. She will not enjoy a fair gamble but wouldn't oppose it either. Similarly with fairly priced insurance. (d) Mrs Green is risk-loving. She would enjoy a fair gamble and would dislike fairly priced insurance. (e) Mr Blue would like to buy insurance, but only if it is fairly or under priced. This question is about the Balance of Payments. Australia's current account as a percent of nominal gross domestic product (GDP) per annum is shown in the graph below. Assume that all foreign and domestic assets are either debt which makes interest income or equity which makes dividend income, and vice versa for liabilities which cost interest and dividend payments, respectively.